Nine student research teams from The Ohio State University presented their final capstone projects at April’s Environmental Professionals Network breakfast held at the Nationwide and Ohio Farm Bureau 4-H Center on April 12, 2016. The Environmental Professionals Network is a service of the School of Environment and Natural Resources in the College of Food, Agricultural, and Environmental Sciences. The breakfast program focused on sustainability success with Columbus Mayor Andrew J. Ginther presenting the city’s 2016 GreenSpotLight Awards and featured an Expo with projects by nine teams of students in the “Assessing Sustainability: Project Experience” capstone course. The course is a requirement of students in the Environment, Economy, Development and Sustainability (EEDS) major, which is jointly offered through the college’s School of Environment and Natural Resources (SENR) and the Department of Agricultural, Environmental, and Development Economics (AEDE). Gregory Hitzhusen, assistant professor in SENR, and Abdoul Sam, associate professor in AEDE, co-taught the spring semester offering. The teams developed and presented projects specifically to support Ohio State’s new sustainability goals. “The projects this semester were particularly noteworthy in how immediately they've had an impact,” said co-instructor Greg Hitzhusen. “For example, some of the projects have already had an impact on university planning. 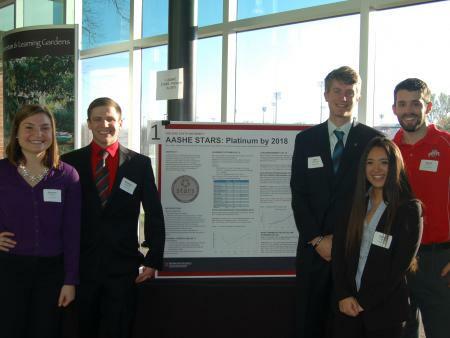 The group analyzing OSU’s AASHE STARS score was able to determine that if Ohio State enhances its sustainability curriculum and stays on course to achieve its recently ratified sustainability goals, the university should be able to achieve Platinum status by 2018. Another group that focused on the Zero Waste culture at OSU is building on their research findings to help the university implement the distribution of 11,000 re-usable mugs for incoming OSU students in the autumn of 2016,” Hitzhusen said.